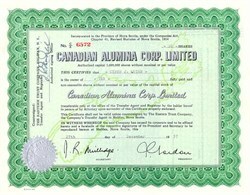 Beautifully engraved Certificate from the Canadian Alumina Corporation issued in 1958. This historic document has an ornate border around it with the company name and seal in a unique aluminum type print material. The certificate has a under print of an outline of Nova Scotia, Canada. This item is has the printed signature of the company president and is over 47 years old.